Despite the bewildering name, buckwheat is related sorrel, knotweed, and rhubarb, and has played an important role in diets around the world – mainly in the Balkan Peninsula, Eastern Europe, Russia and Asia – for thousands of years. You may be familiar with Japanese soba-noodles, Russian blini, north Indian kuttu pakora and puri, and even French galette - all made of buckwheat flour. As pseudo-cereal, it is technically non-grain, and therefore gluten-free and easy to digest. I have experienced this first hand when having used buckwheat, quinoa and millet for a month and then suddenly consuming Basmati rice. As much as I’m accustomed to eating rice, and love it, it dries up the body more, and may cause constipation. If you want to let your alimentary tract to rest for a while, choose buckwheat. However, I wouldn’t recommend it daily because it increases the fire element and passion of the body. Unlike rice that cools down, buckwheat supplies heat. Buckwheat contains high levels of calcium, magnesium, potassium, selenium, zink, and iron, and provides more well-balanced protein than grains in general. In fact, the amino-acid score of buckwheat’s protein is one of the highest among plant sources. Combined with pulses, it will give you more than enough fuel to live and prosper. In addition, buckwheat has niacin and folate, which are B-group vitamins. Being whole-food, there is plenty of soluble fiber to slow down the rate of glucose absorption; insoluble fiber to speed intestinal transit time; and resistant starch, which is sometimes mentioned as the third type of dietary fiber, advantageous to overall colon health. You might be interested to know that buckwheat is the best source of bioflavonoid rutin or citrus flavonoid glycoside, which is an antioxidant. It strengthens capillaries and can help people who bruise or bleed easily. Rutin has also anti-inflammatory, preventive and healing effects, and there are indications that it can inhibit some cancerous and pre-cancerous conditions. Buckwheat grows so readily that it hardly requires pesticides and chemicals. As for the taste, it is nutty and robust, and makes a statement. You can’t confuse it with any other grain or grain-like flavor. Neither can you hide it! I would say that it takes a while to get used to, especially if you want it to substitute rice or other neutral side-dishes. I like to use roasted buckwheat groats, known as kasha. It is easier to cook and doesn’t mash together like the raw version. I also think the aroma is more delicate. For breads, I use both flakes and flour. 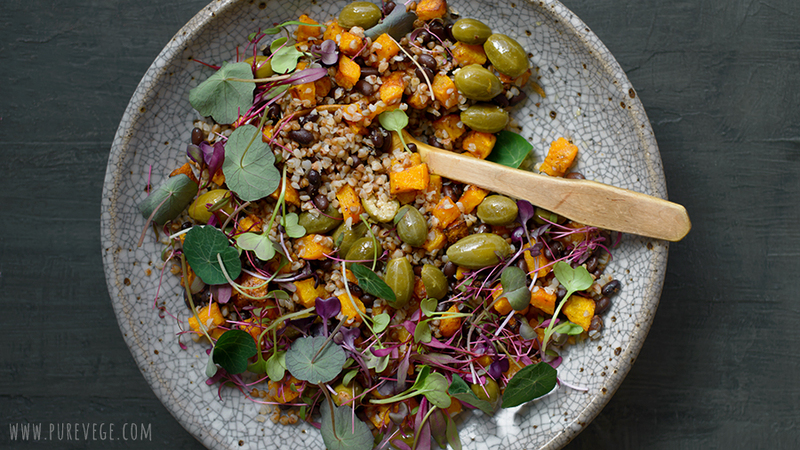 In my today’s recipe buckwheat makes a warm salad with black beans, roasted butternut squash, micro-greens and capers. I planned to add salty fresh cheese and toasted cashews to it, but forgot! wow, I love buckwheat but I didn't know it was related to rhubarb! This salad looks so gorgeous and the information you've provided about buckwheat is really balanced and helpful: so often health fads embrace a new whole food and we learn about its advantages but not disadvantages. It's good to know why we shouldn't eat buckwheat every day. Buckwheat contains tannins or naturally occurring plant polyphenols that bind and precipitate proteins. They are responsible for the astringent taste that makes teeth feel funny after eating rhubarb, spinach, or sour berries, and they react against iron and other minerals, interfering with their absorption in the gastrointestinal tract. They may also cause irritation of the stomach and bowel and, in the worst case, liver damage. To reduce tannins, blanch the buckwheat groats in plenty of boiling water for a couple of minutes then drain, rinse and cook them again: 1 ½ part water to every 1 part buckwheat. Tannins are water-soluble and disappear by this trick, as well as by soaking, fermenting and roasting the groats. Also adding dairy, lemons or fat helps. Can you advise me as to what to use in place of an egg as a "binder", as in veggie patties? I am making a sweet potato patty which call for an egg. Chickpeaflour is the best because it doesn't become gooey like many flours / starches when cooked. It works especially well with raw, grated vegetables, and absorbs a lot of liquid from them. It doesn't add flavor either. If you make patties from cooked sweet potatoes, maybe a little bit yogurt or sour cream would do the trick? Your information is presented beautifully and informative. Thank you for the lovely presentation. Is Quinoa similar in properties Lakshmi? Thanks for the informative post. As far as I know, they are similar. Compared with most other plant-based foods, both are relatively complete sources of high-quality protein that contains all essential amino acids in adequate amounts. Naturally their fat, mineral and vitamin profiles vary. For example, quinoa has vitamin A and E, which buckwheat lacks. They taste and look different. You can cook them the same way. Beautiful salad. I use buckwheat flour but never cooked it as a whole. Sounds like a great alternative to rice. I don't eat enough buckwheat, but love it to bits! This sounds awesome! It's been a while since a didn't consider buckwheat - your recipe just reminded me to put it back on my weekly ingredients list. I love your photos! Thank you for sharing your knowledge so generously. Cheers to eating a little more buckwheat! Hello Lakshmi, apologies if this is a double posting. I thought I left a comment earlier, but apparently it did not "stick". I wanted to let you know that I featured your website on my blog today. I slightly adapted your recipe for warm buckwheat salad, making my own version. Thank you for the inspiration. Your blog and photos are lovely. Thanks Martine, your salad looks yummy! Thanks for sharing. I found your blog searching for some recipe with the buckwheat flour.. This salad looks divine! Love buckwheat and what a beautiful array of micrograms to go with it. Colorful :) Happy Holidays, Lakshmi! In India, we use buckwheat flour (Kuttu ka atta) during fasting, so i always relate it to all things good and scared. However never thought of using whole buckwheat. This definitely is a very healthy recipe!